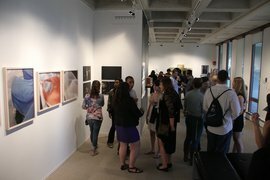 Each year, Ithaca College’s Handwerker Gallery showcases the talent of graduating seniors in a student curated art show. This past spring, senior Leaf Ye curated an exhibit she titled ARTiculated, which featured work by 30 student artists. The show included photography, paintings, silkscreen, and sculptures. Ye was excited to finish her college career as the curator of this annual exhibit. “It is a great opportunity for me to put the knowledge I have learned from the history of art and museum studies into action,” she said.